The purpose of strategies for the integration of fluid dynamics and physiology is the development of more reliable simulation tools to accelerate the process of scale-up. The rigorous mathematical modeling of the richly interactive relationship between the dynamic response of biosystems and the physical environment changing in time and space must rest on the link between coupled momentum, energy and mass balances and structured modeling of the biophase. With the exponential increase in massive computer capabilities hard- and software tools became available for simulation strategies based on such holistic integration approaches. The review discusses fundamental aspects of application of computational fluid dynamics (CFD) to three-dimensional, two-phase turbulence flow in stirred tank bioreactors. 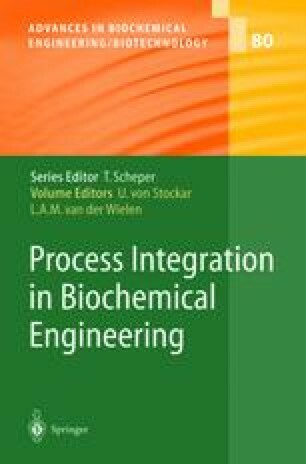 Examples of coupling momentum and material balance equations with simple unstructured kinetic models for the behavior of the biophase are used to illustrate the application of these strategies to the selection of suitable impeller configurations. The examples reviewed in this paper include distribution of carbon and energy source in fed batch cultures as well as dissolved oxygen fields during aerobic fermentations. A more precise forecasting of the impact of the multitude of interactions must, however, rest upon a rigorous understanding of the response of the cell factory to the complex dynamic stimulation due to space- and time-dependent concentration fields.The paper also introduces some ideas for fast and very fast experimental observations of intracellular pool concentrations based on stimulus response methods. These observations finally lead to a more complex integration approach based on the coupling of CFD and structured metabolic models.